Norbury Village Hall, Shropshire is situated in the picturesque Onny Valley, which lies between the Long Mynd and the Stiperstones ridge within the Shropshire Hills Area of Natural Outstanding Beauty (AONB). 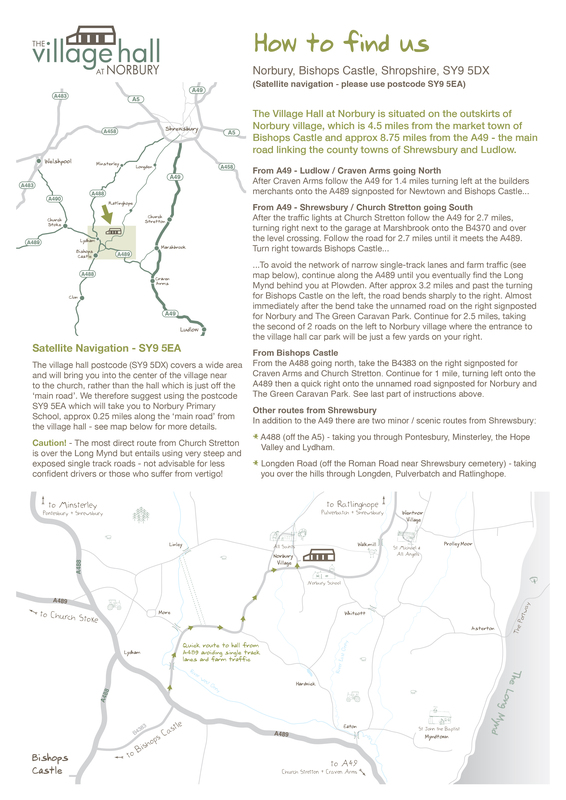 Norbury village is approximately 4.5 miles from the market town of Bishops Castle and 8.75 miles from the A49 – the main road linking the county towns of Shrewsbury and Hereford. Click here to see a location map. The surrounding area is designated an Area of Natural Outstanding Beauty (AONB) , and it is indeed very scenic, dominated by relatively small scale farming on the lower ground, and open moorland on the higher areas. Much of the higher land is owned or managed by the National Trust or Natural England, ensuring that it remains unspoiled. South Shropshire is one of the most geologically diverse areas in Britain, and it shows in the amazing landscape. Who would have thought that Norbury was once under a tropical sea – but a close look at any rock in the dry stone wall at the end of the hall field will show the remains of many marine bivalves. The village hall sits on its own level field on the fringe of Norbury with its characteristic stone walling. It is surrounded by farmland, and has a south facing sun-trap terrace looking towards the Long Mynd across the Onny valley. The area is a haven for bird life, with red kites and curlews being seen regularly (and lapwings have returned to breed recently) as well as the more common farmland and garden birds. On a larger scale, when conditions are right, gliders and paragliders which have launched from the Midlands Gliding Club based on the top of the Long Mynd, provide entertainment as they sail silently across the skies. It is amazingly quiet in this area as there are so few busy roads to create the more normal hum of background traffic. None of the roads within the area is classified, but access to the hall is nevertheless easy with a road from the car park which leads towards the A489 about 3 miles away. On a clear evening the stars can be amazing as there is no ambient light from street lights, nor any light pollution visible because of the surrounding hills. However, our car park is well -lit with motion-sensitive lighting to ensure the safety of users. All of the four villages served by the hall are very attractive, and each has its unique characteristics. All have beautiful, peaceful churches and amazing walks through unspoiled countryside; two have pubs (Wentnor and Ratlinghope), one has the village shop (Wentnor) and one has the primary school (Norbury). We are very lucky to have a village hall in such a glorious setting!